The perfection in life which is demonstrated within our reality, co created by our higher self and the Universe is so magical and precious. It align us with exacting circumstances, people, situations even resources to ensure that we expand consciously and grow. 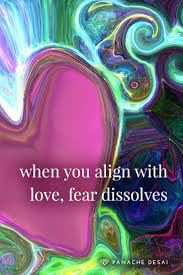 These circumstances can be viewed either via the eyes of Love or Fear. Love shows us the higher perspective, the bigger picture, the grand design, it allows us to remember something deep within our soul, this way of viewing our reality allows us growth and expansion.